Suggested uses for this plant include border, specimen plant, naturalizing, and attracting wildlife. Avoid transplanting trees from the wild which may already be infected with the Dogwood anthracnose fungus. Select trees that have balled and burlapped roots. Plant in acid, well-drained soil in partial shade. Avoid compact or shallow soils. Susceptible to many diseases and insects, including borers, anthracnose, and flower and leaf spots. Many problems result from damage to bark caused by lawnmowers and string trimmers. `Apple Blossom' has apple-blossom pink flowers. `Cherokee Chief' has red flowers, new leaves are reddish. `White Cloud' has numerous creamy-white flowers, especially when plant is very young. 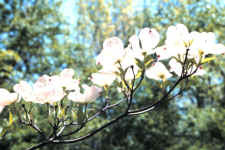 Dogwood is the most popular native flowering tree and is the state tree of Virginia. It is often used as a specimen, in masses, or naturalized under large trees. Interesting in all seasons because of its showy spring flowers, red berries, consistent fall color, and branching habit.